The Polisario is at bay. 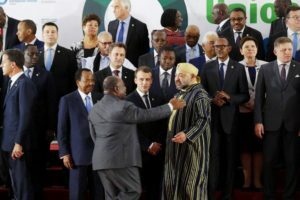 The leaders of the separatist front and the leaders of Algeria are now convinced that the rapprochement between Morocco and South Africa during the AU-EU summit in Abidjan, will eventually neutralize one of the most fervent supporters of the separatist movement in Africa, and marginalize SADR within the African Union. According to a well-informed source in the Polisario headquarters in Tindouf, Brahim Ghali, immediately after his return from Abidjan, brought together the leaders of the Sahrawi front. The single item on the agenda was the successful diplomatic breakthrough by King Mohammed VI at the Abidjan summit. For the Polisario and Algerian officials, the prospects are not promising. If the talks between the king and President Jacob Zuma usher a diplomatic rapprochement between Rabat and Pretoria, this relationship may evolve rapidly towards “a dangerous agreement”. And Algeria and the Polisario are helpless in the face of this diplomatic feat of arms. Moreover, the red carpet welcome reserved to King Mohammed VI at the AU-EU summit in Abidjan has stunned the separatist front and its SADR, that is recognized by none of the European countries present at the summit, not to mention the fact that Algeria, the Polisario’s main political supporter, was isolated in this summit. Contrary to King Mohammed VI who was hailed by both African and European leaders, Algerian Prime Minister Ahmed Ouyahya was almost invisible during the Euro-African High Mass in Abidjan.